By Andrea Milam St. John Tradewinds An impressive roster of stars walked the red carpet at the St. John School of the Arts major annual fundraiser, Broadway Comes to St. John, on Saturday evening, February 15, at the lie Chaplin to Fred Astaire and Ginger Rogers came out to see the culmination of weeks of hard work by Love City fourth graders and the Broadway Five, as theyve become affectionately known on the island. More than 100 residents, who dressed to the nines or donned costumes evocative of their favorite stars, came out to support the show. We support children everywhere on this island all the time, said Lonnie Willis as she and her husband Albert arrived at the red carpet. The people from Broadway give their all, and we want to support them. The fundraiser typically has brought in upwards of $45,000 during each of the past four years for the arts schools scholarship fund, program expansion, and general operations, and of how much was raised at the show was not available at press time. Im feeling wonderful, said Wild prior to SJSA board member Ronnie Lee, who conceived of the idea for the Broadway Comes Broadway stars in his home during their three weeks on island, was looking dapper dressed as Fred Astaire. Were excited to see all the stars here, but the real stars are the fourth grade students of St. John, said Lee. Tonight is the culmination of months of hard work by the faculty and board, and three fantastic weeks that the children and their teachers have put in. Their focus and dedication have been amazing. The students three weeks of hard work paid off, as they dazzled a packed house with their show, Hooray for Hollywood, in which fourth graders from each island school per formed numbers from Hollywood classics. Judy Garlands hit Get Happy from the 1950 three schools sang a sweet rendition of Over the Rainbow from 1939s Wizard of Oz. Gifft Hill School students sang Follow the Yellow Brick Road as the beloved munchkins from the movie. Dramatic performances captivated the audience, including an epic battle from the movie torious over Darth Vader, and a passionate reenactment of scenes from the movie Rocky by Guy Benjamin School fourth graders. The islands students didnt miss a beat during their 22 numbers, evoking laughter, applause, and cheers from the audience. It takes all of us to do what we do, Wild said to the audience. These children have been given a huge gift the arts. After three weeks of pouring their hearts and souls, time, energy, and effort into the SJSA fundraiser for which they were not paid student Sanijah Gris at the culmination of the evenings show. St. John Tradewinds, February 17-23, 2014 3 Thursday, Feb. 20thFourth Graders Dazzle at Hooray for Hollywood EventINDEXAsk the Auto Doctor ............17 Business Directory ..............24 Church Directory .................22 Crime Stoppers ...................23 Cryptoquip ...........................21 Letters ............................18-19 On the Market .....................13 Police Log ...........................23 Real Estate ....................26-27 St. John Tradewinds News Photos by Yelena Rogers Fourth graders from all three island schools wowed the at Westin Resort and Villas. More photos on back cover and Red carpet photos on page 27. 10 St. John Tradewinds, February 17-23, 2014 www.facebook.com/yelena.rogers.photographyYelena Rogers Photography PO Box 554, St. John, VI 00831 340-774-4027 603-401-4757 Sunday 10am HAWKSNEST BEACH facebook Freshwater Church St. John USVITerry Lansdale, Pastor 340.514.6578(CHILDCARE AVAILABLE) St. John Tradewinds Greetings to all our friends and neighbors. St. John Rescue held our February 6 meeting. The elections will be held at be elected to the following positions: president, vice president, secretary, treasurer, chief, training to engage our younger members in the administrative activities of ST. John Rescue. We are still searching for members of the community who can assist us with the day to day operations of St. John Rescue. Building and vehicle maintenance, radio dispatching and services, and administrative work. You would not be required to answer emergency calls and you could set your own hours. Please consider helping out your volunteer emergency medical agency so the responding members can spend more time training. The Coral Bay Open golf tour nament was a super success. The support we received from our friends and neighbors exceeded all expectations. We had a great time and the funds we received from the maintain our building, equipment, and to support our training schedule. We have several more advanced training sessions set for April and May. These training sessions are invaluable but costly. directly to the purchase of medical and training supplies, training nance and upkeep of our building and vehicles. So many businesses and individuals helped us with the golf tournament. The members of St. John Rescue are so very grateful to them for giving up their time Thank you. need is to raise funds towards the purchase of our headquarters. We are asking for our friends and neighbors to get together to form a syndicate that would provide ST. John Rescue with a loan of $240,000 that we could use to pur chase our headquarters building. It would take a group of our supporters to pool their resources and provide us with the funding we need. We would make monthly payments at a negotiated amount including interest. Please help support us. We are currently paying nearly interest only on our lease. We need your help. If you can help please call me at (340)626-5118. We now have agreements with their oxygen tanks for free. This service saves the taxpayer money. Previously agencies had to send tanks to St. Thomas or St. Croix cause of the transport costs. to sign the agreement. It seems would rather use taxpayer dollars them for free. In addition, St. John Rescue has been trying to get a signed agreement with the Department of Justice for responding to DOA calls on St. John. After eight years of trying to get someone in the DOJ to prepare and sign an agreement we still have no such agreement. Another example of government at work. Please consider taking a CPR class. We offer CPR every month on the second Saturday starting at 9:30AM. Please contact me at msn.com to sign up. The fee is $30.Elections Set for March 6 MeetingSt. John Tradewinds News Photo ST. JOHN S LAW FIRM SINCE 1989Real Estate / Land Use / Environmental / Trusts and Estates / Probate Business Entities / Consulting / Litigation / Personal InjuryLocated at beautiful Est. Lindholm, aboe Asolare, 340-693-8255, www.stjohnilaw.comJ. Brion Morrisette & Raf Muilenburg, Partners Clyde Murphree, Of Counsel Dont miss this wonderful evening of art, music and wine!LIVE MUSIC AND NEW ARTbyT. BREEZE VERDANTINLAY & MARQUETRY ARTIST AND MUSICIANWINE TASTINGatISLAND CORK FRIDAY NIGHT FETE BEST OF BOTH WORLDSFebruary 21, 2014 6-9 P.M. Mongoose Junction, St. John To The Rescueby Bob Malacarne, NR-EMT, ASHI, NAEMT JANUARY During the month of to the following calls for assistance: Jan 9: motor vehicle Jan 13: Patient Transport Coral Bay J an 14: DOA service Catherineberg Jan 26: Marine Rescue Jan 31: Patient Transport from Myrah Keating Smith Center class for the crew of Kekoa. By Jaime Elliott St. John Tradewinds Looking for a charming, move-in ready villa which boasts breath-taking views as well as a notyet-completed, but already stunning dream home to Look no further than Southern Cross and Dolce Vita, two houses nestled on a bluff overlooking Chocolate Hole Bay. Both houses are being sold for $3.5 million, exNash. These two houses are on one lot and are being offered at one price, Nash said. The homes are located on a 0.68-acre parcel in brightly colored bougainvillea and more on the lush property. Southern Cross and Dolce Vita are just a Cruz Bay, while the alabaster beaches on the islands North Shore are only a short drive away as well. Southern Cross is the move-in ready villa on the land. The home has four bedrooms and four bathrooms and features mahogany and native stone details throughout. The impressive great room boasts cathedral ceilings and offers sweeping views of that stunning water just outside. The great room at Southern Cross leads right into the open-plan kitchen, which features beautiful cabinetry and stonework created by local craftsmen. en-suite bath, offering guests total comfort and privacy. shade and plenty of sunshine. A covered outdoor dining area is nestled just off the great room; making it a perfect place for romantic al fresco evening meals. Or watch the sun peek over the horizon as you sip your morning coffee on the oversized deck to start a perfect Caribbean day. A few steps down from the main deck, leads to the refreshing pool. Stretch out on a lounge chair while soaking up those beautiful water views and enjoy the sound of the waves crashing onto the rocks below. Included in the price of the meticulously maintained and beautifully constructed Southern Breeze is Dolce Vita, an impressive stone house that is 80 percent complete, Nash explained. The all-stone Dolce Vita is a perfect project for project from scratch, said Nash. Dolce Vita is actually two structures; a main house and a guest house. While the home is not a completed project, what is there is stunning. From the conch shells nestled into the stone over the arched brick windows and the towering great room to the pillar-lined walkways, slate roof and copper gutters, Dolce Vita is a masterpiece just waitFor more information on Southern Breeze and 776-6666 or on her cell phone at (340) 642-2246. St. John Tradewinds, February 17-23, 2014 13 Opportunity and Stunning Views Await at Southern Breeze and Dolce Vita PO BOX 429, ST. JOHN, VI 774-1625 ACROSS FROM LIBRARY U. S. VIRGIN ISLANDS 501 (3) c NON-PROFIT ORGANIZATION St. John Tradewinds News Photos Views abound from Southern Breeze in Estate Chocolate Hole. St. John Tradewinds, February 17-23, 2014 17 St. John Tradewinds Q: Im considering buying a used car here on St. John and want your advise on what would be the best way to go about this. A friend of mine bought what he thought was a great deal and it ended up being a total nightmare with major repairs right after he bought it. A: been more appropriate than when purchasing a used car or truck. Im glad you asked this question because position. You need to have the car checked out by Pre-Purchase Inspection and anyone considering buying a used vehicle needs to make this minor investment to help prevent them from a major repair cost after the purchase is complete. Before taking the car for its Pre-Purchase Inspection, ask the seller if you can take the car for an extended test drive across the island, not just a quick 5 minute drive. I always suggest that you take this test drive with a friend, with the windows down, the radio OFF and no talking so theres no distractions and you can both listen very carefully for any noises coming from the engine or suspension. This test drive is a most critical time, so you both really do need to pay close attention to any problems or concerns you have during a 30 minute test drive as opposed to a quick spin around the block. Make notes so you can explain any noises or concerns you have to the mechanic that checks the car out for you. He wont be able to take it for as long a test drive as you. ALWAYS, ALWAYS, did I say ALWAYS, have any car or truck checked out by a reputable, PROhard earned money. Dont check the car out yourself or ask your friend or neighbor who knows a little about cars to check out the used car or truck youre interested in buying. This situation seems to be most prevalent with guys. My experience is that most guys that have ever had their head under a hood, changed oil, replaced spark plugs or put on a new fan belt feel that they are an expert mechanic and capable of knowing if a used car is a good buy or not. Fortunately, most women have enough smarts to realize that they dont have the exmechanic to render a realistic assessment of the cars condition. Sorry guys, the ladies win out on this one. Its called a Pre-Purchase Inspection, and is the best money you could ever spend before buying a used car. Some shops will only charge you a few dollars to walk around the car, kick the tires and stick their head under the hood to listen to the engine run. This is not the PPI youre looking for. You want to the car up and inspect the entire underside, remove all the wheels to check the condition of the brakes and hydraulics as well as do a complete inspection of the suspension, especially the front end. A thorough PPI should include performing a computer diagnostic scan to check for any trouble codes that have been to a seller that tells you not to worry about the check engine light because its always been on. It can be a minor problem or a major expense to repair what is acutlly causing the check engine light to come on and youll want to know this before you buy. For a complete and comprehensive PPI you will end up spending $75-$100 and should get a full written report that lists any problems found and an estimated cost to do those repairs. This is invaluable information so you can make an informed decision whether to buy the car and spend the money for the needed repairs or pass and keep looking for another car. Most times if you confront the seller with the written report and estimate of what it will cost to perform all the needed repairs you can get the seller to negotiate and lower the price the amount of the repairs needed, or at least not a perfect car so you cant really expect the seller to restore the car to perfect condition. So try to be reasonable, and try to come to a compromise on the price. Anyone selling a vehicle should be happy to allow you to take a vehicle theyre selling to your mechanic for this inspection prior to purchasing. Any seller that wont allow you to take the car to YOUR mechanic usually has something to hide. If any seller is reluctant or refuses to let you have their vehicle checked out by you need to walk, no RUN away from that vehicle. then it probably is too good to be true and keep lookmechanic for the Pre-Purchase Inspection. Whenever by Jack Brown Ask the Auto Doctor Buying a Used Car on Islanda buyer calls me and wants me to perform a Pre-Purchase Inspection on one of my customers cars I always insist that they have a different shop do the inspection so they will get a completely independent, third party, have a mechanic that youve been dealing with, then ask your friends or neighbor if they can recommend a reliable mechanic to check out the car before you buy it. Always ask the seller if they know of any problems the car has been about the condition of the car being sold, even if its a good friend or someone youve known for a long time. Youd be surprised and amazed at just how dishonest some people can be when it comes to selling a car. turns out that I got burned by people I knew and thought were honest, Continued on Page 23 The annual sale will include a variety of colorful colius, above, as well as native plants.Annual Audubon Plant Sale Is March 1St. John Tradewinds If youre looking for a great variety of plants and tress at reasonable prices come see us at the The Marketplace (2nd level parking lot) from 9 a.m. to 2 p.m. on Saturday, March 1. Once again the VI Audubon Society will offer a wide variety of plants and trees; most obtained from various VIAS members and from local growers/landscapers, who generously donate plants for the groups annual fundraiser. If youre looking to add palms, bay trees, mahogany trees, some natives, desert rose, agaves, ornamentals such as Josephs Coat, lantana, ruellia, plumeria, periwinkle and other garden favorites to your landscape make sure to stop by. Vegetable plants will also be available including: tomatoes, lettuce greens, eggplant, sweet and hot peppers, kale, collards, edaname and banana root stock. Many diverse herbs will be for sale including: cilantro, parsley, dill, basil, mint and garlic chives. This list is only a portion of what will be available. The organization will have orchids for sale, too. This event is the major fundraiser for VIAS. Money raised is used to sponsor programs for school children and to continue efforts to, preserve, restore and enhance the wildlife sanctuary at the Small Pond at Frank Bay, a Virgin Islands designated Wildlife & Marine Sanctuary. For further information contact co-chairs Dave Spoth at (716) 472-6888 or Mary Moroney at 779-8091. 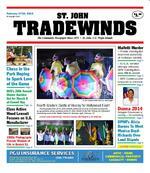 18 St. John Tradewinds, February 17-23, 2014 Crossword Answers Puzzle on Page 24 NEXT DEADLINE:THURSDAY, FEB. 20th2013-TO-DATE 1st Degree Burglaries: 1 Rapes: 1 2014-TO-DATE Rapes: 2 Letters To St. John TradewindsThe current investigation into the stabbing mur der of James Malfetti and the frustration his parents are experiencing is all to similar to the situation we faced for years and continue with since our son Jamie Cockayne was stabbed to death on ST. John June 19, 2007. of compassion and communication is a repeat of our experience. Our prayers are many and our hope for their sons killer to be arrested, tried and convicted is steadfast. Someone knows what happened please be brave and come forward. Sincerely, Jeanie and Bill CockayneCockayne Parents Pray for Malfetti FamilyIn response to the article written last week in the Tradewinds, and Senator Barshingers report. I would like to clear up a few things I feel are being misunderstood. First, I feel we were, as a parent body, taken aback by the forum of the meeting. I for one, thought it was going to be an open forum. Like the meeting we had back in October, where almost every parent that was there got up and spoke. I guess, I just wish we had known they were going to be calling people to testify, that way we could have been just as prepared as the Senate Committee were. To clear up what Senator Barshinger is doing; he is taking a tally, NOT registering children for school. He would like to have at least 100 children on that list so show that we have enough students for next year to a) keep the school open, b)keep all grades that are there grades. I just got off the phone with Ms. Catherine Stephen, whom we are to ask for, and she informed me that parents are confused. Rightly so, my goodness, registering your child for public school here is no easy task. There are a number of things (such as a Blue Slip) you have to have even before you make that trip to St. Thomas. If you are lucky you will have been told that you can register here on St. John, but only on certain dates. This year, Monday March 24, you can register your 1st-12th grader. Doesnt make it easy for parents that work through the week. If parents have any questions, they can contact me This, I believe is a critical time for the Guy Benjamin School, please take the time to be counted, or when more. Anna Adams A Coral Bay Mom Nancy was a sister to all. Nancy Hayes: February 13, 2011 In Memoriam Gennaro Francis Mancuso T ruly One of a Kind In Loving Memory of Gennaro Francis Mancuso Geeno Safe Travels. 20 St. John Tradewinds, February 17-23, 2014 St. John Tradewinds welcomes notices of community-orient T uesday, February 18 Frank Cummings of at the V.I. Audubon Societys next meeting on Tuesday, FebMarketplace. W ednesday, February 19 The Coral Bay Community Council (CBCC) will have a public meeting on Wednesday, February 19, at 6:30 p.m. to discuss the American Institute of Architects (AIA) Sustainable Design Report for Coral Bay, St. John, and next steps for Coral Bays future. The meeting will be at the Guy H. Benjamin School, Room 6, in Coral Bay. W ednesday, February 26 There will be a general meeting for all veterans of the armed forces living on the island of St. John on Wednesday, February 26, from 10 a.m. to 3 Administrator located at the Battery in Cruz Bay. Veterans should bring documents. The The National Honor Society will sponsor a Fight for Civil Rights Night on Wednesday, February 26, from 5:30 to 6 p.m. at Gifft Hill Schools Upper Campus atrium. Saturday, March 1 If your looking for a great variety of plants and tress at reasonable prices come see us at the The Marketplace (2nd level parking lot) from 9 a.m. to 2 p.m. on Saturday, March 1. Once again the VI Audubon Society will offer a wide variety of plants and trees; most obtained from various VIAS members and from local growers/landscapers who generously donate plants for the groups annual fundraiser. Saturday, March 8 The 28th Annual Gifft Hill School Auction will be on Saturday, March 8, at Caneel Bay Resort. 776-1735 for more details. Saturday, March 15 The American Cancer Bark for Life event in the Bay, St. John. This event is a fundraiser, and proceeds will be used for cancer advocacy, prevention and education throughout the district. For more infor mation, call 775-5737. T uesday, March 18 The St. John Communi ty Foundations 25th Anniver sary Community Impact Work Session and dinner meeting will be Tuesday, March 18, at the Bethany Moravian Church from 6 to 8 p.m. ALCHOLICS ANONYMOUS MEETINGS All meetings are now open. Monday, Tuesday, Wednesday and Friday 6 p.m. Nazareth Lutheran Church, Cruz Bay; Thursday 7 a.m. Nazareth Lutheran Church, Cruz Bay; Sunday 9:45 a.m., Hawksnest Bay Beach; Tuesday, Thursday and Saturday 6 p.m. at Moravian Church, Coral Bay NARCOTICS ANONYMOUS MEETINGS Narcotics Anonymous has open meetings from 6:30 to 7:30 p.m. every Saturday at St. Ursulas Church. AL-ANON MEETINGS For Al-Anon meeting location and times, please call (340) 642-3263 ObituarySt. John Tradewinds A celebration of life and public service for Victor of many, will be held on February 18, 2014. Victor Skep, went to be with God on February 6, 2014. In honor of all Veterans, the American Legion Hall in Subbase will be the site of the celebration starting at 10:30a.m. Born on March 15, 1925, in St. Thomas, Virgin lived on Garden Street. He was a member of the All Church, where he served as an acolyte for more than a decade. Victor, Sr. was an active member of the Charlotte Amalie High School Class of 1944. While at CAHS, Skep was really involved in Volleyball and Basketball with many of his lifelong friends including Mr. Wincompany of his friends at the Tau Beta Alpha Social Club. At CAHS, he also met his future wife Thelma ceived the Forsythe Scholarship to attend college at Syracuse University in New York. After attending the university for one year, Victor, Sr. was drafted into the U.S. Army in 1950 and served until 1952. Prior to his deployment to Puerto Rico, Victor and Thelma were Successfully obtaining his Bachelors Degree, The Jeannette and Victor, Jr. After working his way up in the Virgin Islands Government, he became the Director of Personnel. While in this position he assisted the V.I. Government System. Victor contributed immensely to the formation of the Merit System and the policies guiding the Around 1963, Vic, Sr. was handpicked by the newly independent island of Trinidad, to assist them in developing their personnel division. This honor required him to relocate himself and his family to Trinidad for one year. After returning home, he completed his stint as Director of Personnel and move on to be the Director of Maternal and Child Health, from which he subsequently retired. Having more time to indulge in his love for tennis, Vic, Sr. became ranked #1 in Puerto Rico and the Virgin Islands in both singles and doubles with his longtime friend and Islanders to compete in the U.S. Open. Another major accomplishment included the founding of the Virgin Islands native son. Victor was preceded in death by his loving wife Heaggans; sons-in-law, Julien Harley and Leif Johnson, Sr.; grandchildren, Julice Harley, Jaurel Harley, Jamien Harley, Jennelle Johnson, Monai Johnson and Leif Johnson, Jr.; great grandchild, Jordyn Powschulte, Christine Bryant, Roxanne Wheatley-Wright, Luana Wheatley, Dr. Clayton Wheatley, Maurice Ragster-Wilson, Albert Ragster, Fritzgerald Ragster, Sheryl OBryan-Johnson, Carol OBryan-Henneman, James OBryan, Jr., Meade Gordon, Oliver Gordon, Lt. Col Battalion Commander Janice Ross-Grant, Jewel Ross-Brathwaite, Rupert Ross, Raymond Ross, iver; and many other relatives included in the followGardners, Wheatleys, Barbels, Chardons, Cabalos, Aubains, Walkers, Fabayans. He was also preceded in death by sisters and brothers-in-law, Clarissa Oliver-Wiggins, Octavia Oliver-Ross, Agatha Oliver-Ragster, Doris Oliver, L. Denise Bryant-Moolenaar, Stuart Wheatley, and Brent Wheatley. Thomas Racquet Club. The donations will be evenly distributed to all Virgin Islands tennis clubs as well as VITA, who all continue to foster the passion of Vic Virgin Islands, especially the youth. Obituary submitted by the family. Victor Leopold Ebbesen, Sr.
St. John Tradewinds, February 17-23, 2014 23 Crime Stoppers empowers you to make your neighborhoods safer by reporting information while remaining anonymous. Lets work together to safeguard ourselves. If you know something, say something as law enforcement needs to know what you know. St. John: On Monday, January 20, police responded to a break in at Love City Mini Mart in Coral Bay. The thieves broke in to the business and stole several phone cards, and a large amount of money. Based on information gathered, it was two males that committed this crime. Please help police identify these thieves. St. Thomas: On Tuesday, February 4, at 7:55 p.m., a man walking towards the area of Ivan Bar males. One pointed a gun at him and told him to turn over everything he had. The victim tried to grab the handgun; during the struggle the victim was shot once in his upper chest. The gunman lice identify these dangerous men before someone gets killed. Your tips are making a difference. So far they have helped police make 205 additional arrests, recover over $229,000 worth of stolen property, and take 100 illegal weapons off our streets. Please continue to make our islands a safer place to live by telling us what you know about these, or any other crimes, at www.CrimeStoppersUSVI.org or by calling 1-800-222-TIPS (8477). Crime Stoppers U.S. Virgin IslandsFriday, February 7 10:58 a.m. Virginia man present reporting a hit and run in there area of cident. Hit and Run. Hansen Bay called to report that someone was harassing her at her residence. Disturbance of the Peace. 1:19 p.m. Man of Honeymoon Beach called reporting a 70 year old woman fell and broke her arm. Accidental Injury. 1:54 p.m. Man called to report assault. Simple assault. 1:59 p.m. Man called to report of the Peace. reporting that a man rented his vehicle and returned it with damages. Damage to Vehicle. sistance at her residence. Police Assistance. 9:27 p.m. Citizen of Coral Bay called reporting loud music at Island Blues. Disturbance of the Peace. 9:50 p.m. Citizen present and turned in a lost wallet. Lost Wallet. 10:55 p.m. Auto Accident. Auto Collision. Hit and Run. 10:51 p.m. ADT called reporting an alarm sounding at 16c Mandahl. Saturday, February 8 3:22 a.m. Citizen called reporting a disturbance at Quiet Mon Pub. Disturbance of the Peace. 4:06 a.m. Woman called reporting someone stole her cell phone. Grand Larceny. 12:09 p.m. Manager of Woodys reported a disturbance. Disturbance of the Peace. 4:58 p.m. Man reported a distur Gade downtown. Disturbance of the Peace. present reporting a former tenant removed items from a rental apartment. Grand Larceny. 11:56 p.m. Man called to report an expected death in the area of Mamey Peak. DOA. Sunday, February 9 7:25 a.m. Bellevue man called to report a disturbance with stepson. Disturbance of the Peace. man present to report being harassed by a man. Disturbance of the Peace. 10:54 a.m. Woman of Lower lision in the area of Maho Bay. Auto Collision. called to report an auto collision in Collision. Monday, February 10 9:30 a.m. Massachusetts man present reporting he was involved in an auto accident on North Shore Road. Auto Collision. 2:16 p.m. Alarm company called to report an activated alarm at Peter Bay. T uesday, February 11 10:44 a.m. Bethany man called to report his apartment was broken into and items were removed. Burglary 3. No Time Posted Citizen called requesting police assistance with a male he wanted removed from his business. Police assistance. 5:37 p.m. Woman of Grunwald called reporting she was assaulted by her daughter. Simple Assault (DV). 6:08 p.m. Restaurant manager called requesting police assistance with male he wanted removed from his business. Police Assistance. der arrest and charged with Simple Assault. No bail by order of the court. Defendant transferred to Bureau of Corrections on St. Thomas. Simple Assault (DV). 7:34 p.m. Alarm company called reporting an activated alarm at Peter Bay 13-B. Activated Alarm. 10:14 p.m. Citizen called to report loud music in the area of Motu Bar. Disturbance of the Peace. W ednesday, February 12 11:00 a.m. Florida man present reporting (electrical equipment) stolen from vehicle parked at Pearl Landing, Grand Larceny. 2:03 p.m. Man of no known address called to report that he was involved in an auto accident on Centerline Road. Auto collision. an called to report being involved in an auto collision in the area of Canines, Cats and Critters. Auto Collision. 6:09 p.m. Westin Resort called to report an auto collision in the parking lot at the resort. Auto Collision. 11:30 p.m. Man present reporting someone stole his backpack from a bar. Grand Larceny. 7:02 p.m. Citizen called reporting loud music in the area of Coral Bay. Unfounded Disturbance of the Peace. Todd V. Barnes under arrest and charged with Grand Larceny. Bail set at $35,000. 10:38 p.m. Man called to report that his wifes $4,000 watch was removed from hotel room. Grand Lar ceny (Unfounded).Continued from Page 17Buying a Used Car on Island problem and went out of their way to hide the problem. The couple that burned me had already warmed the car up for a while before I came by to take it for a test drive. When I took it for my test drive it ran and shifted great so I believed them when they didnt tell me about the transmission problem and bought the car. The next morning when I went to move it reverse. What I thought was a good deal turned out costing me just over trust anyone youre buying a car from and ALWAYS insist on test driving it after its been sitting overnight and not been started up yet. You can tell if someones started and warmed up the car before you arrive for the test drive by simply opening up the hood and putting your hand on the engine. It should feel cold, and not even the slightest bit warm. Again, Transmissions take a serious beating here in the islands, especially reverse gear so pay particular attention to see if it engages into reverse as soon as you shift it to reverse when the engine is cold. As dishonest as it is, a lot of times transmission problems are why people try to sell their cars, so they can pass the problem on to someone else before they have to spend several hundreds or thousands of dollars to have the transmission removed and rebuilt. Heres what to watch out for regarding automatic transmissions and this test that can only be done by you, not your mechanic. If a transmission is beginning to have a problem it will almost always take a few seconds when shifted into either reverse or drive to engage into forward and especially reverse when it is completely cold and likely to show this problem and will engage right away like it should. Youd be amazed at how many horror stories I could tell you about people that call me up just after theyve bought a used car and want me to just have a quick look and check it out. I explain that what they really need is a Pre Purchase Inspection even though theyve already bought the car. All too many times its too late and this can turn out to be a post mortem examination. In too many cases what looked like a good deal turned into costing the new owner hundreds and sometime thousands of ing a thorough pre-purchase inspection. I cant tell you how many times Ive performed this Pre-Purchase Inspection and found a vehicle that looks perfect from the outside but under close inspection revealed that it had been in a major accident and the States or worse, that there were major engine or transmission problems lurking just around the corner. I had one customer that brought three vehicles to me for inspections that I advised her to walk away from maintenance records from the owner and I advised her to buy it. She ended up spending a total of $280.00 for the 4 Pre-Purchase Inspections but at the end of it all she ended up with a great car and saving thousands of dollars in major repairs. So you can see that its money well spent to have any used car youre interested in purchasing checked out by a quali your friend open the hood and listen to the engine. Jack Brown has lived on St. John since 1999 and is a technically trained professional mechanic with over 35 years experience, including having owned the largest independent Porsche repair shop in Monterey, California for 14 years. For the last 13 years he has specialized in Jeep and Suzuki repair here on St. John. By popular demand, he will, once again, contribute to the St. John Tradewinds to help with your car questions and problems here on St. John. You can submit your questions to question to the Auto Doctor, you authorize the St. John Tradewinds to publish your question. St. John Tradewinds, February 17-23, 2014 27 COMPLETE REAL ESTATE SE R VI C ESST JO HNS OLD EST R EAL ESTATE F I R M SE R VI N G ST. JO HN F O R 54 YEA R S! INFO@HolidayHomesVI.com TOLL FREE: WWW.HOLIDAYHOMESVI.COM JUNGLE STONE gated estate prop erty in Catherineberg w/ big views of the North Shore & BVIs, custom-designed main house & Pebble Cottage w/ 5 bdrm suites, exquisite great room, chefs kitchen, outdoor dining & sitting areas, pool, hot tub, t ness room, 1100 bottle wine closet, shuffleboard breezeway & more! VILLA KALORAMA Panoramic views from classic modern 5 bdm, 4.5 bth rental villa in Virgin Grand Estates features native stone, ipe hardwoods, glass walls & a secure property. Dramatic great room opens onto 40 foot pool and large verandas for spectacular indooroutdoor living. VILLA MARBELLA Own this stunning 3 bedroom and 3.5 bath custom Virgin Grand Estates villa. View pool and large veranda. Great rentals and sunsets over St. Thomas and Pillsbury Sound. One level living with fabulous Great Room! ENIGHED BREEZES has designer air, great views, minutes from town! 3 bdrm main home plus 2 apts. Special features: contemporary kitchen, sky lights, granite slab counters, Soli Stone backsplashes, traver tine tile, stone showers, vessel sinks, spa tub, & Murano glass tiled pool w/ waterfall. STONE COURT is a 3 bedroom haven. 1 acre of privacy with sweeping views from Rams Head to St. Thomas. Island inspired architecture of stone and wood. NEW CONSTRUCTION! Enjoy Fish Bay breezes & views to Ditleff Pt. in this new, 2 unit home. Masonry, nice nishes, separate entries to each level which feature 2 bdrms w/ bath, covered & screened wrap around porch, great room and kitchen. VERY MOTIVATED SELLERS! Three income producing apartments. Live in one and rent the other two. Easy access to Cruz Bay & beaches. CARIBBEAN COTTAGE RETREAT Relax in this comfort able home surrounded by trees, orchids and birds. Quiet private neighborhood has deeded rights to a beach. You wont get peace like this at a better price. Dont miss this opportunity! SONNENBERG AMAZING VIEWS Perched above Coral Harbor and Hurricane Hole with large pool, 4+ bedrooms and private apartment, Close to town in gated community. TREE PALMS Versatile 5 BR 5 BA property with solid rental history. Charming home w/ 2 kitchens, covered verandas, stone entrance, garden foun tain, concrete pool and spa deck. Solar panels, and ocean views complete the package! KABEJ PATCH Caribbean style 5 bdrm pool villa, in a quiet, breezey location in desirable Chocolate Hole. Beautifully nished Brazilian hard wood home w/ stone accents is charming! Walk to beach. Excel lent short term rental or private residence. DAY DAY DREAM IN UPPER CAROLINA Fabulous views Coral Bay to BVI in masonry 3 bdrm/3.5 bath Majestic Mile home. New furnishings, private pool & bdrm suites, hot tub, stone/brick landscap ing, solar hot water, shutters, custom cab inets & 10k generator. Cute wood cottage (NC) on property. COMPLETE THIS DREAM The ground work has been laid for a new owner to step in and complete this house! Com pleted is a masonary 2x1 apartment and a detached 1x1 wood cottage. INNSTEAD IS AN INCOME PRO DUCER! Charming private retreat in a quiet neighborhood convenient to Cruz Bay features exible oor plan (1X1 + STUDIO; or 2X2) for rental & INCRED IBLE water views! Is land stonework, a/c & large covered deck w/ roll up hurricane shut ters. Great value all masonry! The Company that gives back to St. John OWN A MONTH IN A LUXURY HOME Choose a 3 BR 3.5 BA or a 4 BR 4.5 BA villa in upscale Virgin Grand Estates. These 3,000 sq ft villas feature STT & sunset views, pool, AC & more. Priced from $42,000 $849,000 MLS 13-500 VIDEO $249,000 MLS 12-177 $395,000 MLS 13-410 $3,095,000 MLS 13-454 VIDEO $1,325,000 MLS 12-31 RAINBOWS END AT BATTERY HILLclean and cheerfully decorated poolside condo is conveniently close to town w/ nicely manicured grounds. Seller says make an offer! $465,000 MLS 12-358$995,000 MLS 13-3 $8,340,000 MLS 12-404 VIDEO PASTORY CONDO PALMY DAZE breezy, vaulted-ceiling, 2 bdrm/2 bth condo overlooks outer cays & sunsets. Well-maintained, com fortably furnished w/ attractive fully-equipped kitchen! Great condo community offers lush landscaping, view, pool and convenient parking. $499,000 MLS 13-381 $1,200,000 MLS 13-392 $795,000 MLS 13-467 $649,000 MLS 13-472 BEACHFRONT GRANDE BAY RE SORT Has great views! Beautifully furnished & easy access to shop/res taurants. Large pool & deck area, tness & reception center, indoor parking & elevator service. GRANDFATHERED HOA FEESTwo 3 BR/2 BA from $1,139,000 and 1 BR/1 BA $745,000 $1,235,000 MLS 13-523 $2,450,000 MLS 10-381 $745,000 MLS 13-129 $1,450,000 MLS 14-60 NEW LISTING SEARCH ENTIRE ST. JOHN MLS, VIEW PROPERTY VIDEOS AND NEWSLETTER/SALES HISTORY AT WWW.HOLIDAYHOMESVI.CO M LOTS OF LAND LISTINGS!! MOTIVATED SELLERS!! SOME SELLER FINANCING!! CAROLINA from $ 55,000 EMMAUS hillside $ 75,000 FISH BAY from $ 79,995 CHOCOLATE HOLE from $ 118,500 HANSEN BAY hillside & WATERFRONT $ 139,000 GLUCKSBERG from $ 195,000CONCORDIA from $ 225,000 FREEMANS GROUND from $ 225,000 CALABASH BOOM hillside $ 235,000 VIRGIN GRAND ESTATES from $ 249,900LOVANGO CAY South shore from $ 250,000UPPER MONTE BAY/RENDEZVOUS from $ 799,000 SABA BAY hillside & WATERFRONT from $ 999,000 PETER BAY/NORTHSHORE from $ 1,650,000 WESTIN TIMESHARES from $ 500/weekONE MONTH FRACTIONALS from $ 42,000 HH-TW 2.17.2014 B.indd 1 2/14/14 1:58 PM St. John Tradewinds News Photos by Yelena RogersAngel Ticket Holders Get Red Carpet Treatment February 15.